SealGreen Concrete Sealer is the preferred siliconate sealer used by architects and building professionals for sealing driveways and other commercial or industrial concrete surfaces. Used in:concrete driveways, sidewalks, patios, entryways, ramps, parking lots, shopping center sidewalks, animal cages, zoos, farm stalls, horse barns, foundation walls, new green concrete as a cure and seal, basement walls, window wells, retention walls, pool decks, decorative concrete, concrete salt containers, concrete drains, concrete sewers and manholes, concrete vaults, use as a freeze/thaw mitigator, and many other concrete applications inside and outside. SealGreen Concrete Sealer is an odorless, water-based penetrating, chemically-reactive, siliconate, concrete sealer developed to provide long-lasting protection without changing the appearance of the surface. It does not turn yellow or create a shine. SealGreen Concrete Sealer with our new Salt Defense Technology defends your concrete against salt damage and water absorption thus significantly reducing freeze/thaw damage. 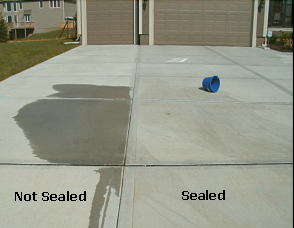 Stain penetration is also reduced making it easier to keep your concrete clean. The concrete will retain its natural look and minimize slippage as the sealer is inside the concrete instead of being a topical sealer that lies on the surface. SealGreen Concrete Sealer is a siliconate sealer (see Concrete Sealer Types) and has larger molecules than any other type of penetrating concrete sealers thereby offering more surface protection. SealGreen will bead water after application and continue to resist water in the form of water sheeting for many years, even after the beading effect has gone away. It has a higher spread ratio (200 sq feet per gallon as opposed to 75 square feet per gallon for silicate sealers) because of the larger molecules. SealGreen has been formulated with the highest percentage of active ingredients available in the market today. What does all this mean to you as the property or homeowner? It means easy installation and minimum maintenance along with exceptional topical closure and deep permanent sealing properties. SealGreen Concrete Sealer is a superior concrete sealer; offering excellent endurance, fusion, superior strength, and a great life span. This is a top quality product. I am very happy with the protection it has provided to my driveway. The ordering online was easy to accomplish, and it arrived within a reasonable amount of time. 01:00 - This is a top quality product. I am very happy with the protection it has provided to my driveway. The ordering online was easy to accomplish, and it arrived within a reasonable amount of time. easy to apply and seems to be working. I need to wait until it snows to see how I feel about it. 5 stars. Effectiveness will show with the passage of time. I ordered this product based off the reviews I read on here, the videos I watched on here, and product information. The videos done on this site, actual application of product as well as comparison videos are great. I used he measurement form provided on this page. My drive came out to be approx. 814sq ft. I purchased two(2) bottles of the 1-quart mixture, figuring I would have some left over. The back of the container states it will cover approx. 350-500sq ft. It instructs to pour contents in 2-1/4 gallons of water and stir gently for 2minutes. I followed these directions and applied to my entire drive with sprayer as shown in the videos. 1-quart mixture(500sq ft) covered my entire drive and stoop...I didn't have to use the second 1-quart mixture I purchased. I thought maybe I sprayed it on too light, but it covered the entire drive! Can only give it 4 stars, because I have yet to see if the stuff worked yet since I only just applied it yesterday! So far I am happy though and plan to purchase more products, probably some cleaner for next year in the spring/summer. From SealGreen: Thank you for your purchase. We highly recommend to apply the second quart very light over the entire concrete because you may have stretch the first quart more that it can cover efficiently. Thank you for all of your help answering my questions when I called you. Your excellent customer service is appreciated and great products.